J. Howard Matthews, in his book Firearms Identification, refers to the Dreyse 9mm pistol as the Model 1910, but the designation does not appear to be widely used. 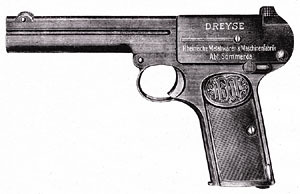 The Dreyse 9mm was designed by Louis Schmeisser for Rheinische Metallwaaren & Maschinenfabrik (RM&M). Schmeisser had previously designed the Model 1907 Dreyse pistol, chambered for the 7.65mm Browning cartridge (known as the .32 ACP in the U.S.). Schmeisser’s 9mm Dreyse design has an unlocked breech like the Model 1907, but the 9mm Parabellum is a much more powerful cartridge than the 7.65mm Browning, and both designs have a rather light reciprocating slide and breech block. When the recoil spring was upgraded to handle the more powerful cartridge, it was found to be too stiff for the breech to be easily opened in order to chamber a cartridge. To alleviate this problem, Schmeisser designed a mechanism to disconnect the recoil spring from the slide. Schmeisser was granted British patent number 13800 on 16 November 1911 for “...a device ... by which the return spring can be disconnected from the breech block, when the breech block is to be opened by hand, so that a return spring can be employed, which would be too powerful to be compressed by hand.” The British patent states that a German patent had been applied for on 27 June 1910. We can presume that Schmeisser may have been working on the design as early as 1909. Production, such as it was, probably ended with the advent of World War I. The gun is not listed in the 1910 Deutsche Waffenfabrik Georg Knaak catalog. So far as I can ascertain, it first appeared in the 1911 ALFA Catalogue of Arms and the Outdoors, and was also listed in the 1913/1914 Albrecht Kind GmbH (AKAH) catalog. 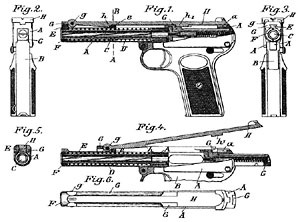 The gun pictured in the 1911 ALFA Catalog is clearly a prototype, similar to the one shown on page 504 of the Göertz and Sturgess book Borchardt & Luger Automatic Pistols. A prototype of this sort was tested by the Prussian Landgendarmerie in December 1910 and March 1911. According to Göertz and Sturgess no gun of this type is known to still exist. A number of changes were made to the early design, including upping the barrel rifling lands from 4 to 6 to increase accuracy, heightening the front sight, widening the trigger, eliminating the screw that held the ejector in place because it kept working loose under recoil, redesigning the pins at the pivot points so as not to work loose, strengthening the walls of the magazine, and increasing the power of the magazine spring. Late in May of 1911 the Dreyse was tested again. Four jams were noted, which were attributed by RM&M (Dreyse) to faulty ammunition. Dreyse stated they would make their own ammunition for the pistol in future, and a few rare boxes of this ammunition have apparently surfaced in the cartridge collecting community (see RM&M 9mm Ammo). 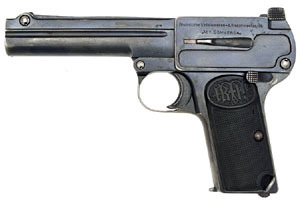 Ultimately the Dreyse was recommended for adoption by the Landgendarmerie over the P08 Parabellum (Luger) pistol. In the 1912 edition of the annual “Thüringschen Waffenindustrie” it was reported that nearly all police forces in Germany were going to buy the pistol, and the Prussian Finance Ministry had ordered 2700 of them to equip the Border Customs officers. However, as it turned out, the Rheinmetall company at Sömmerda ... were unable to produce any significant numbers of working pieces, causing the Gewehr Prufungskommission (G.P.K.) in 1913 finally to declare the whole design not to be war-worthy. 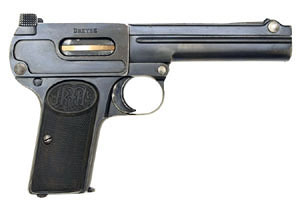 Four known Dreyse 9mm pistols have delay mechanisms for the slide, including serial numbers 1034, 1484, 1461, and an unnumbered in-the-white prototype. Two of these guns are pictured in the Göertz and Sturgess book. Serial number 1461, in the Belgium Army Museum, has had the backstrap cut to accept a Mauser C96 type of holster stock. The three serial numbered guns have serrations at the forward end of the slide and no external ejector lever (the ejector is riveted into the gun). They are described by Göertz and Sturgess as having “an internal spring loaded semi-locking wedge, pivoted on the slide, which is withdrawn from engagement with the frame by the grooved cocking piece at the front above the barrel”. The unnumbered in -the-white prototype is described as having a “long leaf spring over the action to force down the pivoted cocking piece/wedge carrying the rear-sight, to engage the angled semi-locking cam on its underside with the frame”. I couldn’t make much of these descriptions, and would very much like to examine one of these guns myself so as to describe and illustrate the mechanism. A number of specimens in the 1300 serial number range have a bright spot on the left side where something was ground off. Donald Maus’ book History Writ in Steel shows a copy of an announcement from the Thuringia Arms Industry annual report for 1912 indicating that the Prussian Landgendarmerie had ordered 5,600 Dreyse 9mm’s. The order must have been cancelled, though there is no record. Additionally, a number of holsters to fit the 9mm Dreyse have been found that were stamped “LG,” a known practice of the Prussian Landgendarmerie (one is pictured on page 509 of Borchardt & Luger Automatic Pistols). A case could be made that some guns were delivered to the Landgendarmerie and were stamped “LG,” but the stamp was ground off when the guns were not accepted. However, it is not known for certain what was removed from the guns. 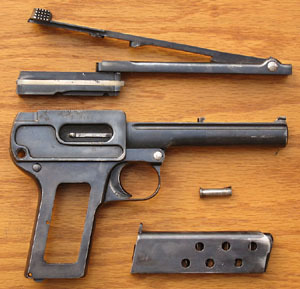 Like the Model 1907, the 9mm Dreyse has a slide that reciprocates atop the barrel, and a breech block that depends beneath and behind the slide. The 9mm Dreyse’s concentric recoil spring is held captive in the upper receiver housing by a bushing at the front of the barrel. The recoil spring bushing extends backward from the front of the barrel and has a lug that projects upward at the rear. The recoil spring disconnector mechanism is in the form of a flat retractor plate that extends across the top of the slide from front to back and is hinged at the front. The retractor plate snaps in place on top of the slide and forms a sort of cover for it. The retractor plate has a lug on the bottom, about two inches back from the front of the gun, which engages the lug of the recoil spring bushing when the retractor plate is engaged to the slide. To retract the slide, all one has to do is lift up the retractor plate and draw the slide and breech block to the rear against the negligible resistance of the striker spring. There is a second lug on the bottom of the retractor plate, toward the rear, which engages a spring-loaded plunger in the top of the breech block. If this plunger is not depressed, the striker is locked--hence, the spring-loaded plunger serves as a disconnector when the retractor plate is open. According to R.K. Wilson, there is no other disconnector. Like the Model 1907, the upper receiver housing is hinged at the front and can be lifted up from the lower receiver. However, the 9mm does not have a latch at the back to unlock the upper housing. Instead it has a stout pin that secures the upper receiver to the lower receiver or grip frame. The pin has a built-in spring to retain it. A similar pin at the front attaches the recoil spring retractor plate to the slide, and a slightly smaller pin hinges the upper receiver to the lower receiver just above the bow of the trigger guard. Once the upper housing is hinged upward, the retractor plate can be opened and the slide can be drawn backward slightly to remove the slide, breech block, and retractor plate as a unit. No further stripping is necessary in order to clean the gun. Like most of the Model 1907 pistols, the 9mm requires the striker to be cocked before it will fire, but pulling the trigger draws the striker back a little further before releasing it to deliver a slightly more powerful strike on hard military primers. Sights are integral with the recoil spring retractor plate. Ejection is to the right through a port in the upper receiver housing. The extractor is made of spring steel and fits in a slot on the right side of the breech block. The ejector is press fitted into the left side of the upper receiver. On the exterior the ejector forms what looks like a lever, but it is not movable and serves no apparent purpose. A rotating manual safety lever on the left rear side of the upper receiver locks the sear when engaged. A pin on the back of the striker protrudes through a hole in the back of the receiver when the striker is cocked. The slide locks open on the last round--held open by the magazine follower. There is a lanyard at the base of the left grip. The Dreyse 9mm pistols that I have examined are marked DREYSE on the right side of the upper receiver in all capital serif characters, and Rheinische Metallwaaren- & Maschinenfabrik / ABT. SÖMMERDA in sans-serif characters on the left side. Matthews states that only the early guns have complete markings. Serial numbers are found on the bottom of the breech block (visible when the slide is locked open) and on the frame just in front of the front hinge (but the upper receiver must be lifted up to see it). Some magazines are numbered to the gun, and some are not. Arms of the World--1911, the ALFA Catalogue of Arms and the Outdoors. Follett, Chicago: 1972. Firearms Identification, Volume I, by J. Howard Matthews. Thomas Books, Springfield, IL: 1962. German Handguns, by Ian Hogg. Greenhill, London: 2001. History Writ in Steel: German Police Markings, 1900-1936, by Donald Maus. Brad Simpson, Galesburg, IL: 2009.
and information I wouldn’t otherwise have had access to. Copyright 2011-2013 by Ed Buffaloe. All rights reserved.